Pete Wentz finds it "odd and slightly amusing" that his band, Fall Out Boy, is issuing a greatest hits collection. After all, it's been only four years since the Illinois-based foursome released their major-label debut, the multi-million-selling From Under The Cork Tree, and since that time they've put out just three other albums. "Greatest hits records are a funny thing," Wentz says. "I always think of them as being from bands with loads of huge songs. Fall Out Boy, we're kind of a different group." Indeed, the appearance of a greatest hits set (the official title is Believers Never Die - Greatest Hits) is fanning the flames on Fall Out Boy fan sites with rumors that the band (which also includes singer-songwriter and guitarist Patrick Stump, guitarist Joe Trohman and drummer Andy Hurley) might be pondering a breakup or a split from their label. 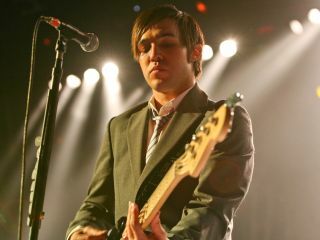 Wentz, bassist and lyricist for the group, record mogul (he runs Decaydance Records, home to Panic! At The Disco, Cobra Starship, The Academy Is...among others) and all-around media darling (he married singer Ashlee Simpson in 2008; the two have a year-old son, Bronx), takes on these issues head-on during the following MusicRadar interview. "People want us to say 'we're breaking up'...It's just that we've been doing this for seven or eight years, and we need a break." He also graciously answers some questions from MusicRadar readers - and one mind-twister of our own. Whenever a band releases a greatest hits CD, two things come to mind: A) the band is breaking up or B) the group is leaving its label. Any truth on either of these fronts? "I'd say no to both. We're not leaving our label 'cause I know we own them records still. And as to the breaking up, people want us to say 'we're breaking up' or 'we're taking a hiatus.' It's just that we've been doing this for seven or eight years, and we need a break. "People want an answer of when we'll be back, and I think it's impossible…it's unfair to say when we'll do Fall Out Boy again. It's hard to be creative. You just feel compressed all the time. We just want to let ourselves decompress." You guys don't have 20 albums to sort through, so was it hard to come up with a tracklist for a greatest hits collection? "No. We're not putting this out and comparing it to Aerosmith or The Beatles or Bob Marley. This is more like 'greatest hits for Fall Out Boy.' The way we picked the tracklisting was, 'Well, here's every song we did a video for.' We left a few songs off. "And then we recorded two songs and we're putting this Christmas song on, and a DVD commentary. The artwork also has messages to our fans - some are hidden, some of them are right there. A lot of it is just a thank you to people who have stuck with us. "We wanted to call the record Believers Never Die - it's just a phrase that stuck around Fall Out Boy - but we were allowed to be convinced to go out with Greatest Hits in the way that it's an 'Idiots Guide To Fall Out Boy.' We were trying to think of ways to call it greatest hits, but I feel like every funny or quirky way has already been done." The new song, Alpha Dog, is more of a return to your earlier sound. Did that just kind of happen naturally or did you want to return to the old sound? "Ahh. Interesting. I feel like the two new songs…I don't know…I just only look at the lyrics, so they feel different to me. But we recorded those songs at the same studio where we recorded From Under The Cork Tree, so there was some magic in that. But that's interesting…yeah." You're including your cover of Beat It. I'm sure Michael Jackson heard it before his death. Did he ever remark about it? Did he ever comment to the band about it? "Nah. I wish. We never got the chance to him. I don't even know if he heard it. We kind of recorded it on a whim, like, nine months before he passed away. We've decided not to play it anymore. It's his song, you know? We put it on the record because we did a video for it, but it's definitely his song." Has being a husband and father changed your writing in any way? Do you find lyrics are coming our different? "For the first six months after Bronx was born, I couldn't write at all, and then all of a sudden I started writing again. I think it made me look at the world in a different way. We have a very selfish culture, and we all embrace it, and that's what I Don't Care was supposed to be about, and what America's Sweethearts was supposed to be about. "I hate explaining lyrics 'cause it feel like 'whatever.' But I Don't Care was about looking at a picture of yourself in the mirror, like the ultimate form of narcissism." Your life is pretty much an open book, at least on Twitter. Do you worry about overexposure - do you think that you should have more mystique like rock stars did back in the day? "No. Because I think I have as much mystique as a lot of rock stars did back in the day. Ultimately, you have control over how much of your life people really see. People might think you're an open book, but you're just opening the door a little bit and letting people see a little bit of you. "But at the same time, with paparazzi and camera phones and the world becoming more globalized, I worry about oversaturation and overexposure. I worry about being in too many places, and there being too much of me out in the world. I'd get sick of me, so I try not to let that happen." Let's shift gears and talk about the bass. Now, you have your own signature Fender Precision Bass - what were your specifications for it? "I wanted a fast neck. I wanted to have those [Seymour Duncan] Quarter Pound pickups in them. For my personal basses, I wanted the volume and tone knobs to be the same knob. I have the volume and tone knobs turned up all the time; you can't turn them off. I was having problems playing live and all of a sudden I'd turn the volume in half. "Also, I wanted something that was light and affordable, for someone who just wanted to try out the bass and was just getting into it. Or if their parents were buying their first one. I wanted something that was affordable and made sense." "As far as practicing, for a long time I was like, 'This is as you're gonna get.' But after Infinity On High, I realized that you can get better at whatever you do." OK, we have some reader questions. The first one comes from The Gibster who asks, How would you say your bass playing has evolved from the band's early days? And do you have a practice schedule? "Well, in the early days, I just wanted to play hard and fast and get off stage, and that was my take on it. But as we got into it, I wanted a metallic and overdriven tone on the records. I play a lot of fills on the records but I don't play a lot of them live. Even being part of the rhythm section I would play with the guitars a lot. "But on Folie A Deux, due to the song structures, I was playing with the rhythm section more, I was playing with Andy, and it changed my playing. I fingerpicked the verse of America's Sweethearts and I picked the chorus. "As far as practicing, for a long time I was like, 'This is as you're gonna get.' It's not like I'm on anyone's Top 10 list. But after Infinity On High, I realized that you can get better at whatever you do. What I needed to work on was my right hand. I play with a metronome when we're not on tour, about every other day. And I play with a metronome to warm up." Jack Krim asks, Hey Pete, I hear that Joe Trohman wants to play more metal-type songs and that he has a metal side project. Is this something you encourage, and might Fall Out Boy incorporate more metal-type songs in their repertoire? "See, I don't know when Fall Out Boy's going to do anything again. Man, whenever you say something for sure, you always set it in stone. I don't think Fall Out Boy's gonna get any heavier than it's ever been before. "I do encourage Joe to take his metal side out and go do something with it. I think he's working on something, but I'm not sure. He told me he was, but I don't know how much they're working on it. But I totally encourage that. He's got good chops for it." Sam Barnett asks, Where do some of the song titles and lyrics come from? Brother To Brothers asks, Pete, I've just formed a band but I was wondering what kind of advice you might have to help us get noticed? How should we self-promote our band? Any tips? "For every band it's different. My one tip would be, don't listen to what other people are telling you as far as, 'You guys need to sound more like this, you need to be more like this.' You can't just get big on the Internet, and you might not get big if you just go around in a van. "You need all the right things going on, and you have to put your heart into it 100 percent. That's how it worked with Fall Out Boy, and then it just spread by word of mouth, and I don't know how to make that happen." And finally, our all-important MusicRadar question: The Beatles or The Stones - and why? "I would say, for me…if it was based purely on the songs, it would be The Beatles. The amount of amazing songs they did in the span of the time period they did them in is insane. So you're a little split. "I'm a little split. But if I was going purely on the songs, it'd be The Beatles. But other than that, man, The Stones are still touring, dude. Anyone who says you're too old for it, you can't complain."